88 Energy (ASX | AIM : 88E) announced on Monday morning that it had successfully completed a bookbuild to domestic and international institutional and sophisticated investors, raising A$17 million in an oversubscribed placement. Not only will the capital raised fully fund upcoming drilling at the company’s Icewine#2 well project located in Alaska which should spud in the second quarter of 2017, but it will also strengthen the company’s balance sheet, providing it with options to pursue promising leads while covering potential contingencies that can occur in the course of exploration campaigns. While the raising was done at a discount (A$0.037 per share) to the last closing price of A$0.042, the fact that it has considerably derisked progress with the highly prospective Icewine#2 project is likely to provide positive momentum once normal trading resumes. Notably, the company’s shares traded as high as A$0.04 on Monday morning, an 8% premium to the raising price. In particular, the raising gives the company the opportunity to capture the full positive share price impact of promising exploration news without the potential offset of questions that could otherwise be raised regarding near to medium-term funding. In discussing the capital raising, Managing Director Dave Wall said, “As we approach this part of Icewine#2, it is imperative that the company’s balance sheet is managed appropriately to account for worst-case scenarios, such as cost overruns on drilling”. 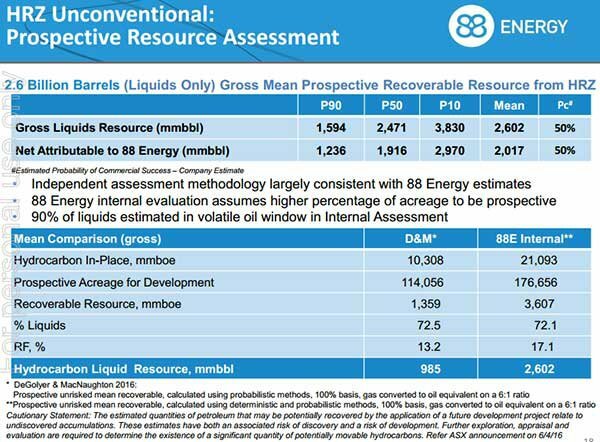 To date, 88E has impressed with its ability to consistently meet milestones as outlined below. Should everything go to plan, Wall highlighted the fact that the additional capital would be used to further the exploration effort at Project Icewine as the group looks to unlock the large potential of both the unconventional and conventional plays on the acreage. Following the capital raising, analysts at Hartleys reaffirmed their positive opinion on the stock. The broker had previously modelled a breakeven oil price of US$40 per barrel in relation to a prospective production scenario. This would provide substantial margins based on the current oil price which is in the vicinity of US$55 per barrel. Of course, investors should be aware that like all commodities, the oil price can move up or down. 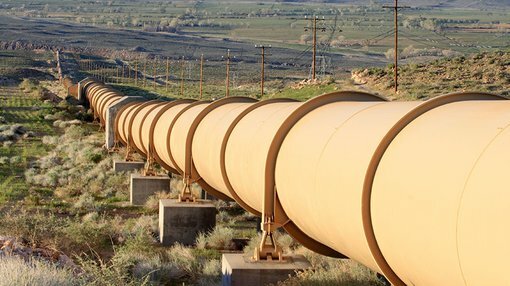 Investors should not invest solely on future oil price scenarios that may or may not eventuate. Like all oil explorers, 88E is a speculative investment. Hartleys’ confidence regarding a HRZ sweet spot is based on important facets such as thermal maturity and resource concentration, but also porosity, permeability and pressure. 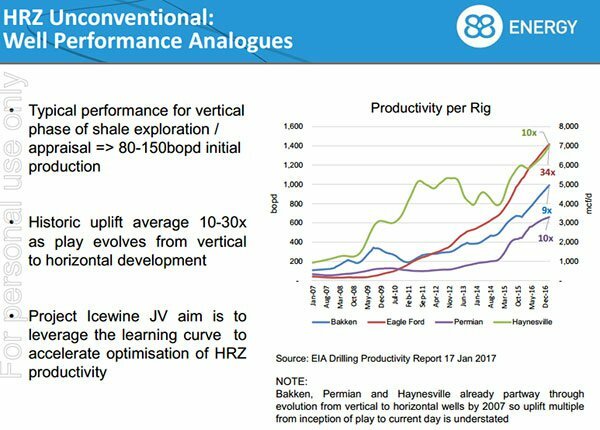 As indicated below, the establishment of a HRZ unconventional project would be a game changer for 88E given the substantial increase in output that is traditionally achieved when transitioning from vertical to horizontal development. 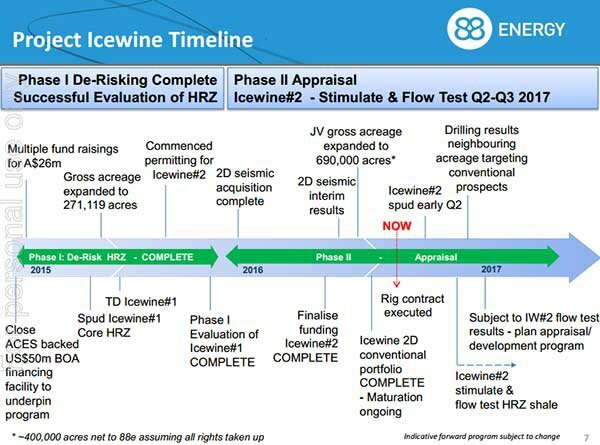 Should 88E have success at Icewine#2, the resource is ideally situated in terms of infrastructure with all-year road access and the potential to tie into an existing pipeline. 88E has been expanding its position in Alaska since 2015 with its initial interest in Project Icewine occurring after the company entered into a binding agreement to acquire a significant working interest (87.5%, reducing to 77.5% on spud of the first well) in a large acreage position on a liquids-rich exploration opportunity in an onshore region of Alaska, North America. In June 2016 the gross acreage position was expanded to 271,119 contiguous acres (net 210,000 acres to 88E). In December 2016, the company successfully bid on additional acres. On award, the project Icewine gross acreage position will be further expanded to circa 690,000 contiguous acres (approximately 400,000 acres net to 88E, assuming all rights are taken up).